Life without social media seems unthinkable in this day and age. The youngsters, particularly, are hooked to social media. If you are nodding along, our post is for you. 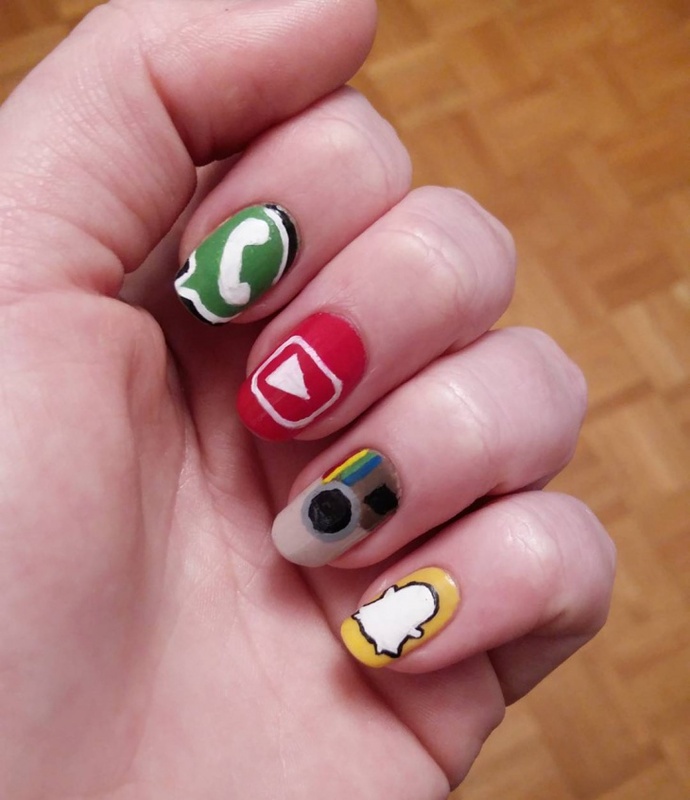 To all the social media frenzy lasses who tweet issues, post selfies, Instagram their meals, have fun on Snapchat, subscribe Youtube tutorials, we have some wonderful nail art design ideas for you. 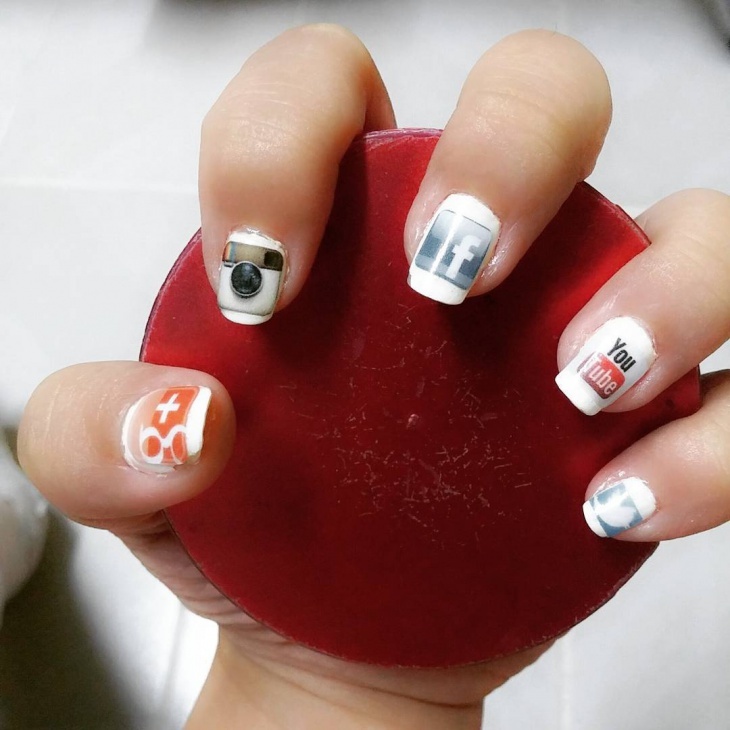 This nail art design is like bringing all social media networks under one umbrella, except here you are bringing them under one fist. Start by applying a transparent glittery base coat. 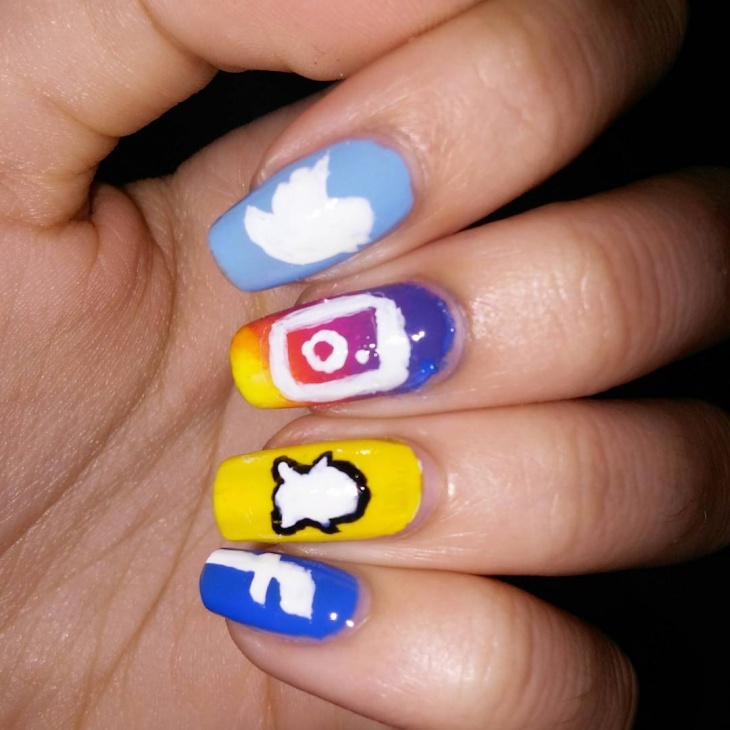 Wait for it to dry and draw a heart nail art with different colors, each depicting a social media website. Complete the design the by filling the hearts with the respective social media logo. The design is easy and perfect for short nails. Make sure you have all the required colors with you. Another design where you can cover all your favorite social media websites except here the uniformity of colors is maintained. Yellow and gray compliment each well as a combination and provides a subtlety to the art. The design looks absolutely effortless and delightful. White, sometimes, provides a perfect background. It can make a design and colors stand out and enhance them. Take this design, for instance, white base is giving an immediate attention to the different social media logos. But as much as we believe that white can define the nuances, we would also like to warn that it can highlight the errors as well. So, make sure you draw the logos perfectly or visit your nearest nail art salon to get the design done perfectly on your nails. Admit it, some of us are a little partial towards Facebook. After all, it is one platform where we can write, comment, share, like, watch, react and do all that social media jazz. This is a simple french manicure design that requires two different shades of blue. Do the french manicure on all your nails with those two shades. 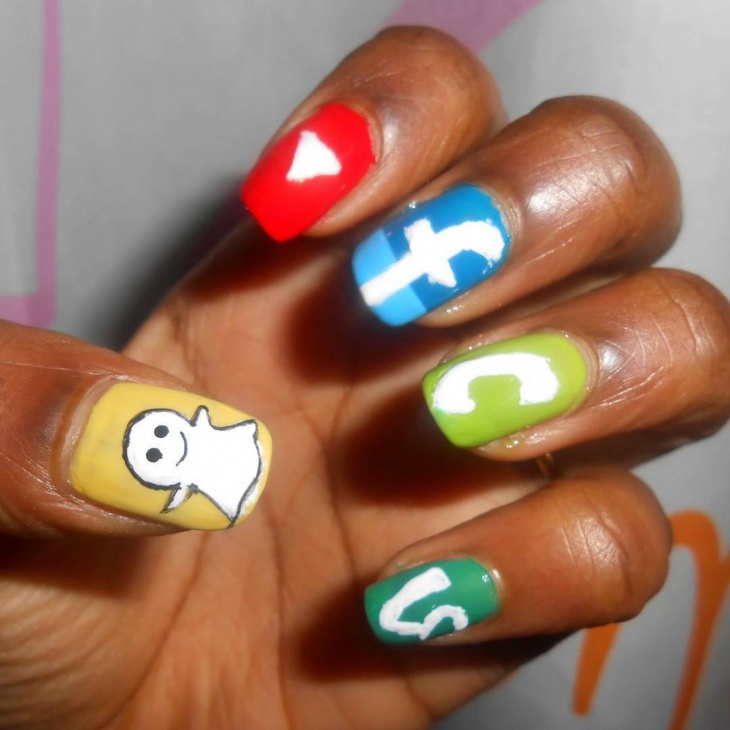 Once the manicure is settled and dried use white color and draw the Facebook logo on the third nail of each hand. Perfect design for the beginners. This design has various social media logos and has been done with a variety of colors. You don’t necessarily have to put on the same design. 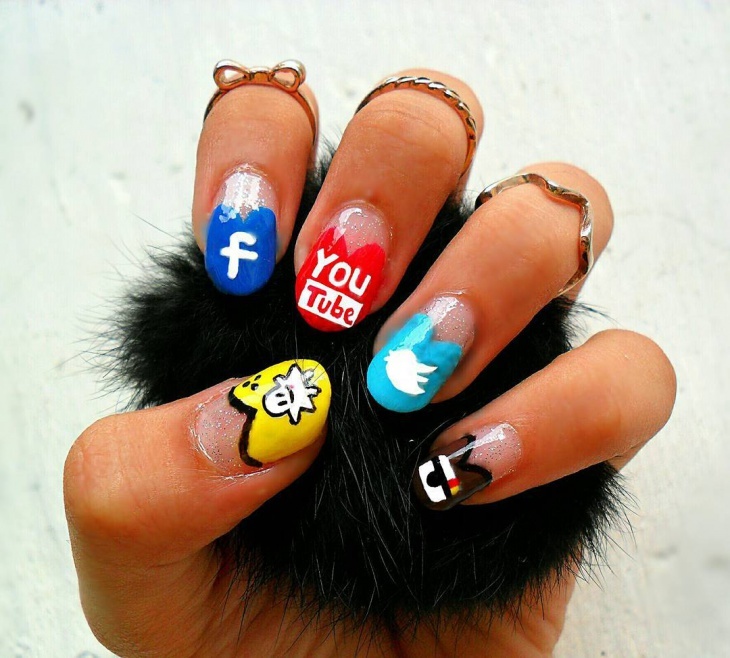 You can choose you favorite social media platform and create a similar design on your nails. Whether it is a makeup tutorial or a recipe or just a random funny video that made you laugh during your lonely hours, Youtube has been to our rescue innumerable times. This design is a perfect tribute to the video giant. 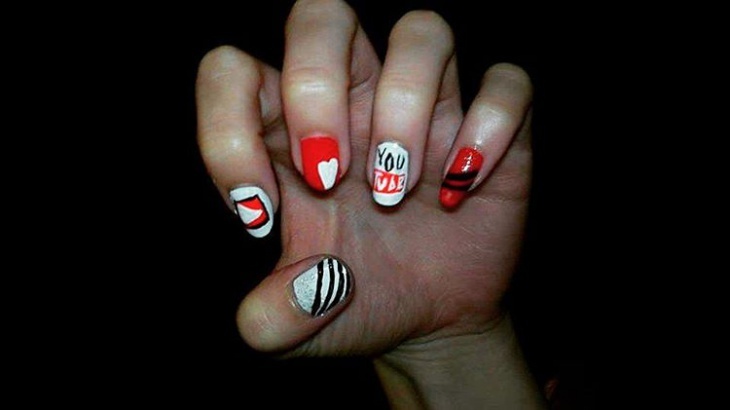 White and red with hearts and Youtube logo looks adorable. 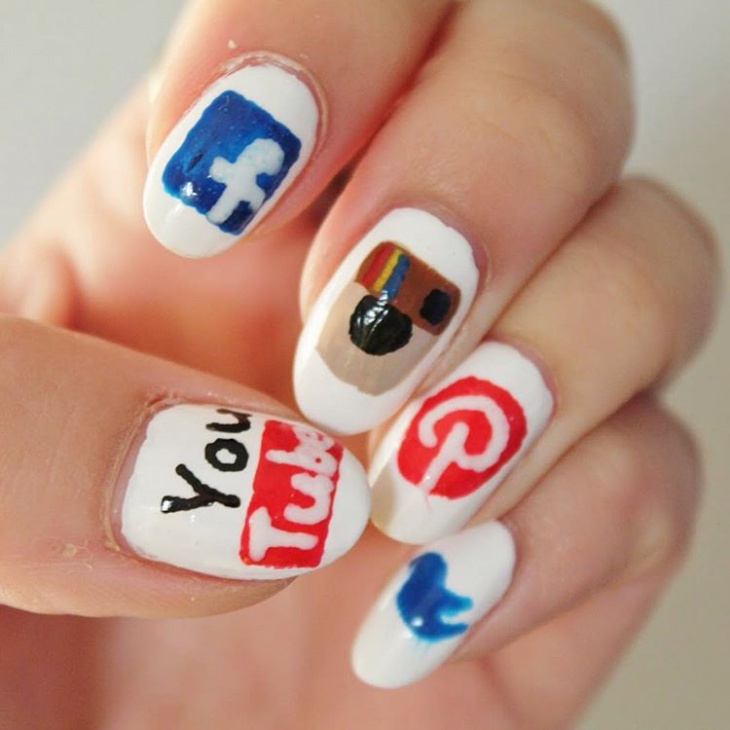 If your social media apps are the best thing about your smartphone then you should not hesitate in trying this nail art design at all. 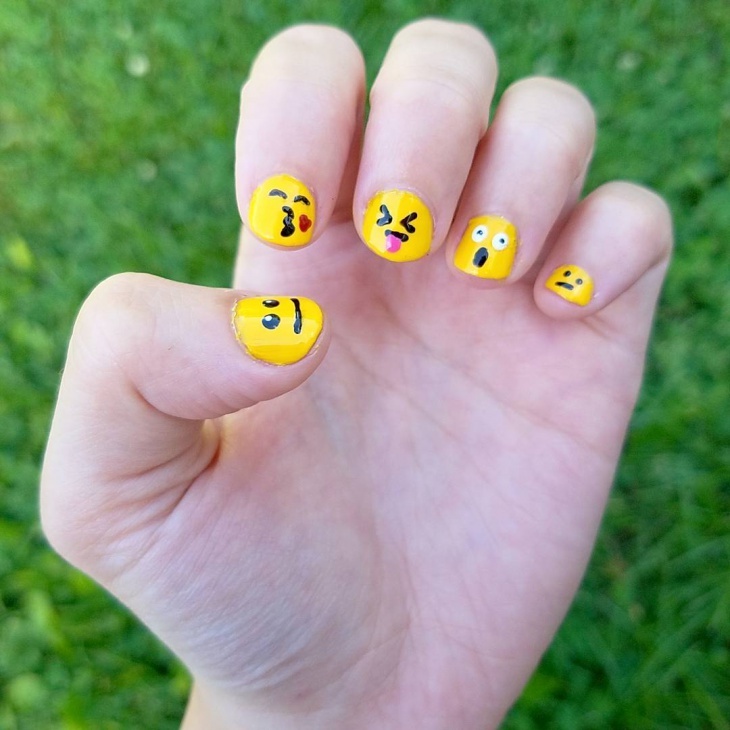 Every time you take out your phone and open your social app, the glance at your nails will certainly bring a smile to your face. It is a sin to talk about social media and forget emojis and we are certainly not going to commit it. 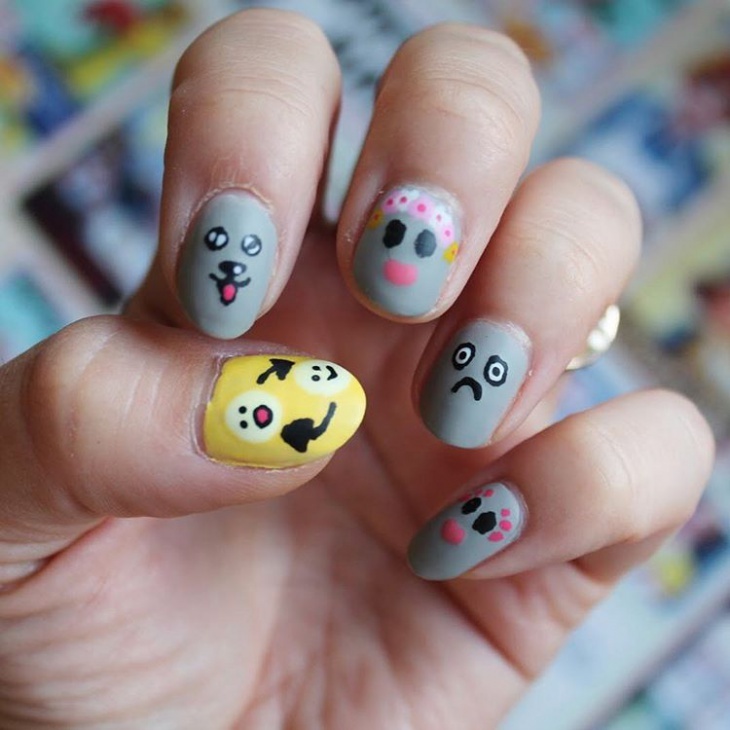 Go ahead with your yellow nail color and draw the cute nail art design on your nails. 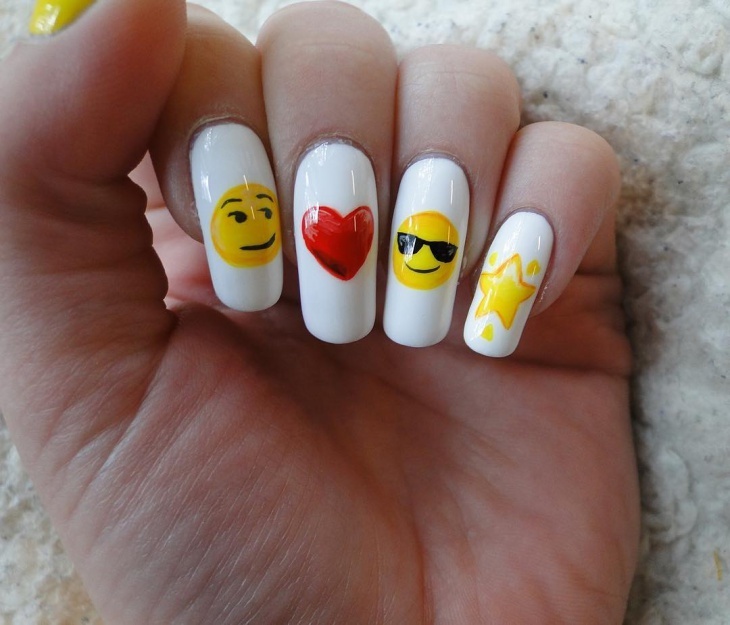 Let your nails be your sunshine. 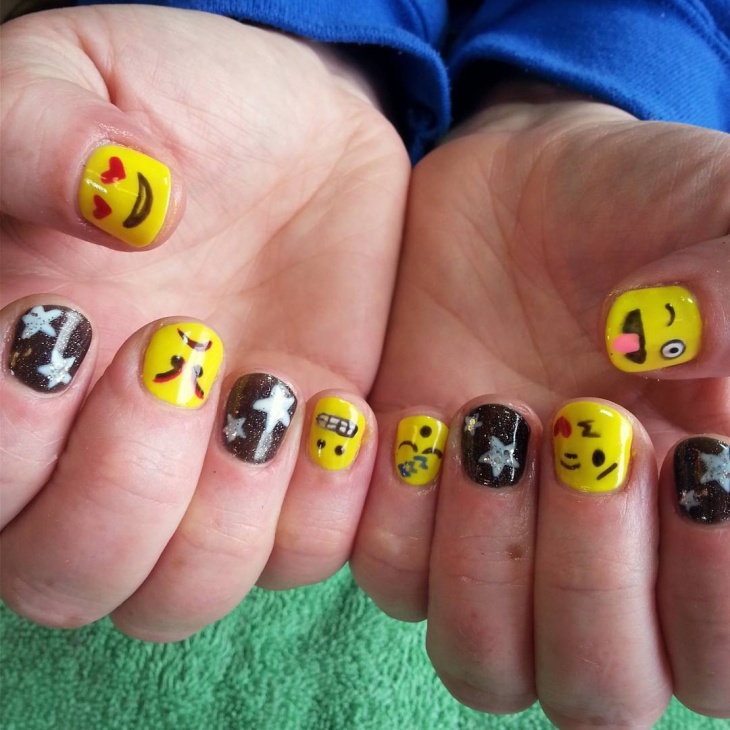 This is nail art is for the fellows who like bold designs. 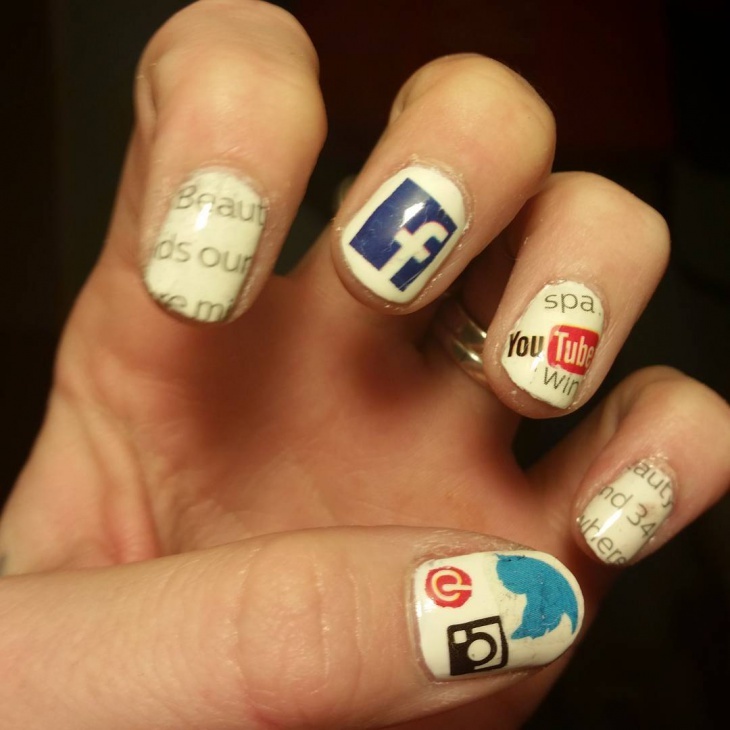 This nail art clearly confesses your love for social media. 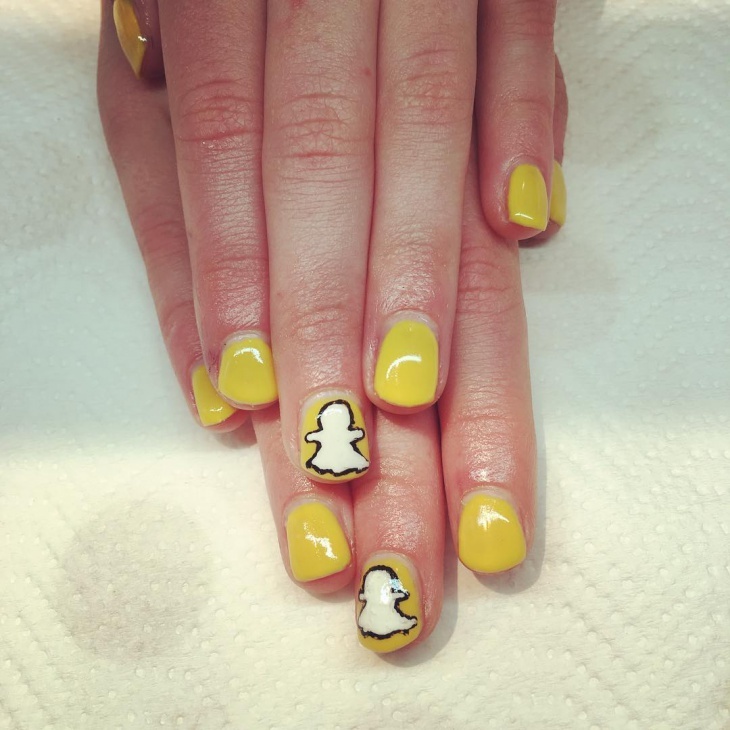 Make sure you have long nails for this design otherwise things might get messy. 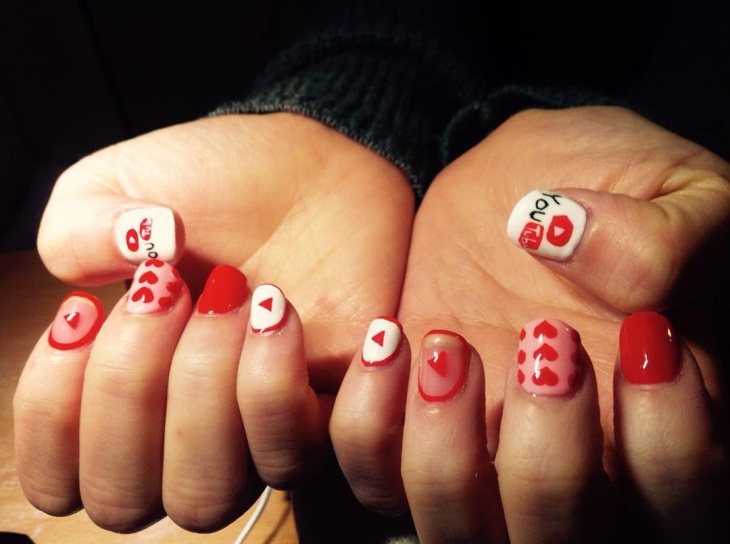 We hope we inspired you to try and create beautiful nail art designs. Make sure your share these on your social media profile and declare your social media obsession to the world.